Self-defense in modern society is about far more than carrying a gun, it's also about developing situational awareness. This means knowing where you are and what's going on around you at all times. 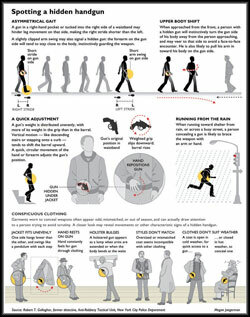 Based on the experience of Robert T. Gallagher, former NYPD detective, Anti-Robbery Tactical Unit, this detailed illustration, titled Spotting a Hidden Handgun, explains some of the visual cues that reveal when someone is carrying a handgun. Click on the graphic to get a close up view. You can also use this information to avoid providing others with the same visual cues which may alert them that you are carrying concealed.